Sullivan is adamant United can make an impact during the campaign. “I know the potential that is here. I know Tommy [Dunne], he worked at Cork City, I played against Galway last year. I thought the club was decent, but I felt that it needed something. A part of me maybe thought that something was me. I don’t know. It is a great environment to be in. I was told about the facilities so I wanted to come onboard. Having made an impression in the success over Pat's when anchoring the Galway midfield alongside skipper Ryan Connolly, Sullivan reckons the future is bright out west. “We want to finish in the top six,” Sullivan says about United's ambitions. “You want to be knocking on the door for fourth or fifth. It is as simple as that. Anything more than that probably isn’t realistic with our budget. The top four have massive budgets and massive squads. We want to get there, but this year is a stepping stone. This is where you build. “Of course the club can develop. It is one club, one town. The lads talk about it when we go for coffee. We look around and we think this club could be massive. We have spoken about how to get crowds at the games, it is simple: win. If you win. people will come. Sullivan's physical presence and positive energy has impressed his colleagues, who need to "believe in themselves' more, according to the Dubliner. “I find a lot of teams and players have self doubt thinking we are going to play Pat’s, we are going to play Dundalk. I don’t care who they are. I don’t care what their name is or what they did in the past. Last Friday we went out, we believed in ourselves. In the dressing room I said I feel great, I keep telling them to believe in themselves. They’ve put the hard work in, you eat well, you look after yourself, just believe. Aiding and assisting in the development of the younger players such as Conor Melody and Padraic Cunningham interests Sullivan. “We have very good young players, extremely good players. I tell them, the gaffer tells them. They are only young so they can only get better. Maintaining the high level of performance achieved in Inchicore is a significant challenge Sullivan will relish. *Galway United Supporters Trust is running a bus to Sligo for the match against Sligo Rovers at the Showgrounds on Monday, March 14, departing The Dail Bar at 4.30pm. To book a seat contact Dominick Walsh 087-9163438 or Stephen Dowling 086-2361040. 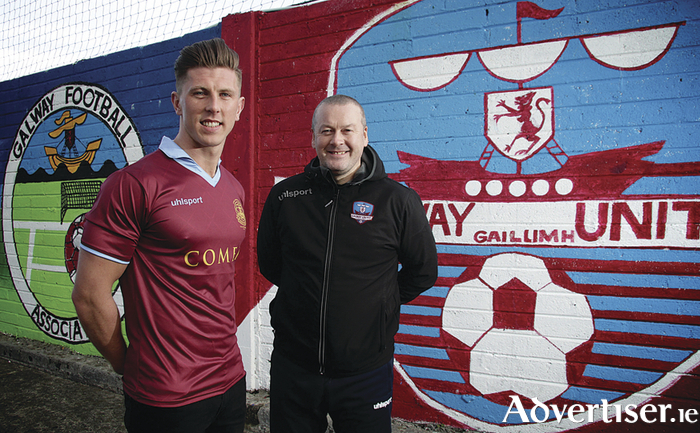 The Galway United club shop will be open at the Eyre Square Shopping Centre this Saturday, March 12. Season tickets, merchandise and club lotto tickets will be on sale.